Built upon the original GradApp, Naples-based MassiveU has designed an interactive, project-based social learning portal to help high school students learn about and take action toward available opportunities after they graduate. 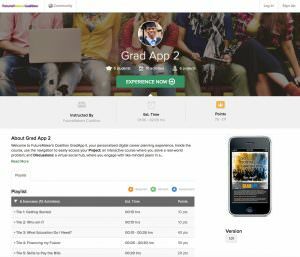 GradApp 2 features comprehensive information, activities and videos about career opportunities, skills and education requirements, education planning resources, available scholarships and financial aid, money management, links to local, state and national resources, and more. Students earn points through the completion of activities and may connect with other students through the platform. Throughout the experience, students build an ePortfolio that they can share upon completion, which can also be referenced by mentors to guide discussions with students. Students can enroll by visiting http://futuremakers.massivecte.com, clicking the ‘Sign Up’ tab in the upper right corner of the page, entering their information and clicking the ‘Submit’ button. The app uses open enrollment so students can enter from the home page and enroll in the program without receiving a specific invite. The first version of the app went live in 2014. The updated app is aimed to facilitate ease of access and increased usage from students by integrating a “hands-on” game based approach to a platform of six tiles – starting from learning about a sense of self to a senior checklist and financing their future. The 21st Century Learning experience is designed to take less than 30 minutes. Mentors will also have a foundation for focused discussions by having the ability to review and track responses from students, rather than just teaching lessons from the app. Wells Fargo’s corporate giving program is committed to supporting initiatives that promote academic achievement for low- to moderate-income students and facilitate merit-based access to higher education for underrepresented groups. MassiveU is a leading B2B project based social learning platform-as-a-service company based in Southwest Florida. MassiveU works with the world’s leading content providers, publishers and trainers to best support college and career readiness among students and teachers via its innovative technology solutions. The goal of FutureMakers Coalition is to transform Southwest Florida’s workforce by increasing the number of college degrees, certificates or other high-quality credentials from 37 percent to 55 percent by 2025. The Coalition is made up of regional partners in the areas of education, government, business, nonprofit, citizen stakeholders and advocates committed to creating a cradle-to-career pathway to ensure success for traditional students and adult learners. The FutureMakers Coalition was one of Lumina Foundation’s 75 national Community Partners in Attainment. Residents are encouraged to join and support this community-changing initiative. For more information, visit www.FutureMakersCoalition.com, call 239-274-5900 or email Tessa LeSage at [email protected].